In general my interests cover a wide range of snow and glacier topics, from snow metamorphism to avalanches and glacier mass balance and glacier area and mass change in response to a warming climate. Methodologies include both in situ and satellite data. Current focus is on determining how much river discharge originates as melting seasonal snow and how much as melting glacier ice across High Asia, the CHARIS project. This distinction is important because while seasonal snow cover returns every year, albeit in varying amounts, glaciers disappear as a result of a warming climate—and that water source is totally lost for the current era. Across the five full basins of the CHARIS study (east-to-west, Brahmaputra, Ganges, Indus, Amu Darya, Syr Darya) the annual contribution to river discharge from melting glacier ice for the period 2010 to 2015 averages around 1%. 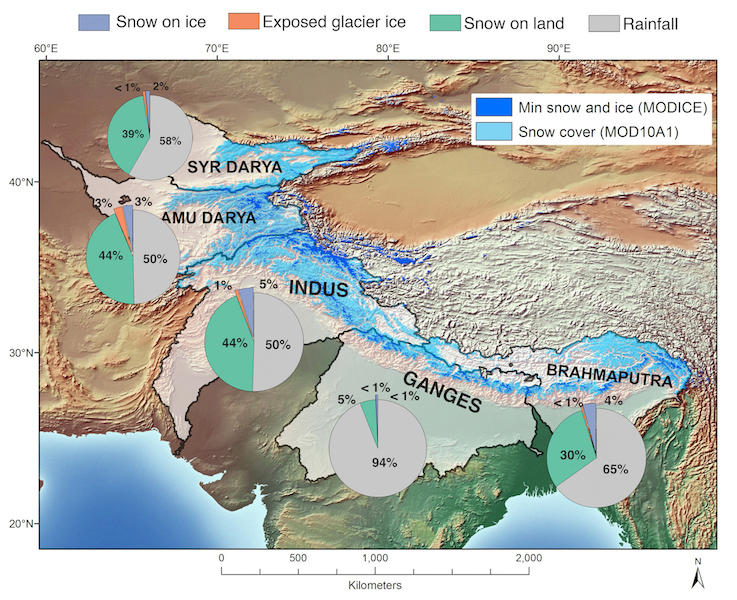 However, the contribution from seasonal snow cover ranges from approximately 40% in the west (Indus, Amu Darya, Syr Darya) to approximately 30% for the Brahmaputra and 5% for the Ganges (see figure 1.) The remaining river discharge results from rainfall and ground water. Within the 3,000- to 6,000-meter elevation band the contribution of glacier ice slightly exceeds 1% in the east increasing to approximately 5% in the west. The contribution from seasonal snow cover within this elevation band ranges from approximately 65% to 75% in the Indus, Amu Darya, Syr Darya, and Brahmaputra to approximately 40% for the Ganges. Melt from glacier ice makes a significant contribution only during the months of June, July, and August. During these summer months in the Ganges and Brahmaputra the river discharge is dominated by monsoon rainfall. In summary, glacier melt water contributes greatest to river discharge in the countries considered most vulnerable to drought, for example Pakistan and Afghanistan, and therefore glacier melt serves as a buffer against drought following winters with less than normal snowfall combined with lack of summer rain. While slow glacier retreat is being observed in the east, glaciers appear to be more stable in the west (higher elevation and higher latitude than the east), and the seasonal snow cover does not show a statistically significant reduction over the past 15 years in the west. The CHARIS project has established collaborative partnerships with 11 institutions in 8 countries (Bhutan, Nepal, India, Pakistan, Afghanistan, Kyrgyzstan, Tajikistan, Kazakhstan). These partnerships provide a two-fold benefit through both capacity building and sharing of in-situ field data with University of Colorado researchers. A total of 9 training workshops for partners have been conducted by CU staff over the past 5 years covering the topics of fundamental glaciology, digital elevation models (DEMs), geographic information systems (GIS), satellite data applications, mountain hydrology, water chemistry, snow cover and glacier mapping and melt modeling. These partnerships promote and facilitate the international cooperation required for successful cross-boundary water resources management on a regional, not just a national basis. Figure 1: Mean annual melt contribution of snow, ice and rainfall to runoff in full CHARIS basins – 2001-2014.